antiX M-7, The Fat-free Simply Mepis: Simply Mepis is a Linux newbie’s dream. It is known for its ease-of-use and its exceptional hardware detection. A new lightweight flavor of Mepis, which is intended for older hardware was released recently. It is called AntiX with a code name “Lysistrata”, and so I quickly jumped into trying it out. Xubuntu RC is already installed on our old laptop, but I was tempted to also install AntiX on it. So I got the ISO image of AntiX live CD from here, and then burned it on the CD after. I also made sure to copy some of the important files from my laptop using a couple of online backup services and other Linux data backup tools. To begin the installation, just right click to display the main menu, and then click ADMIN TOOLS → MEPIS ADMIN → INSTALL. A terminal will appear then just type “root” for the password. After this, the installation menu will appear and believe me it will be an uncomplicated process from here. The installation on my system was fast and flawless. The hardware were well-detected, and everything worked as normal from audio, video, DVD-drive, Ethernet, and USB. I find AntiX slow to boot compared to Xubuntu running on our not-so-old laptop. It is also less responsive considering that it has a lighter Fluxbox desktop. At login, there is an option to use ICEWM but I preferred to use the default FWM for this test. The desktop look is not as polished as that of XFce, but I still like it because of its geeky appeal. Linux beginners will find the FWM unfriendly the first time that they will use it, while the novice will love it for its simplicity. The very reliable Synaptic will smoothly take care of installing, removing, and updating software applications for AntiX. 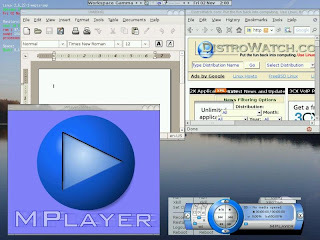 Also, there are plenty of pre-installed applications on AntiX like Xchat, IceWeasel, gMplayer, Brasero, Flash, and plenty more. As I’ve said, Synaptic is your friend if you want to download and install additional packages. There’s no question about the stability of a Debian based system. Though I can’t really make a concrete judgement regarding AntiX’s steadiness based only from the short period that I have used it, I can declare that it is secure enough for regular computer tasks. I’ve encountered few bugs while using a number of applications, but it is only minor and did not really affect its overall performance. I would say that AntiX is highly recommended for those who have older machines because of its dependable hardware detection and its light footprint. While it did not perform as well as Xubuntu on my older laptop, I still consider AntiX as a very promising distro that could easily beat any lightweight distribution in the near future. I installed AntiX on a Dell Dimension 4100 at my work office.The Dell has 384 megs of memory. On this system AntiX literally flies. You forgot to mention that Rox Pinboard and Rox Panel are available with a simple right click-WM's-Rox-Panel or Pinboard. This gives you Desktop icons and easy control of switching backgrounds. What impressed me the most though was the fact that AntiX detected both my local printer(epson stylus color 400) and a network printer(HP officejet G55) and preconfigured both on startup. I can't say it would do that for everyone, but for me that is usually the deciding factor on actually keeping and using a Linux system. It has brought this OLD dell back to life. I am running the full-fledged SimplyMepis on a system with the same specs he mentioned. It runs just fine, with no speed issues. AntiX is supposedly being released as a Distro for older computers, however, they completely shoved the AMD K6-2 CPU computers out to pasture. AntiX will not boot, and gives a message that the CPU is too old. Why they did this, I don't know. I used to be a SimplyMEPIS fan, but am quickly becoming disappointed in their failure of this point. K-5,K-6 have some special issues. I believe they will be fixed in the next release cycle, so hang in there guys! I had no sound on my laptop after it was installed because the cs46xx driver for the sound card was missing. It seemed that the alsa-modules-2.6.22-1-mepis-smp was not installed at all. I just thought I mention it here in case someone runs into the problem with no sound. Like I had. K-5,K-6 will be fixed.antix runs on little as 64mb of ram,but use a 128mb swap.its great for old computers.ive been a tester since the very begining of the project,it has come along way.a one person developer is a busy man.keep up the good work anti. Running great on my old Thinkpad i1412 .. AntiX brings life to something that was gathering dust. It was great wiping M$95 off of it....it made it dirty. Now it's a clean machine and running on the home network. I'm sure MEPIS AntiX is really great, but a distro that really impressed me when it came to light footprint combined with great usability, was ArchLinux with the modular KDE version installed. Speedy as ever with only 256 megs of RAM, and sexier than Vista to top it all. I came straight from Ubuntu and still I found Arch very user-friendly, so go on and try it if you don't believe me. Thank you all for the comments and info. @Steve: It's good to hear that story. @Sandstrom: I would love to try ArchLinux soon to know it for my self. A nice review, though there must be some problem if Xubuntu runs faster than antiX. Could you put a link to the antiX website. enable debian backports and install the backported 2.6.22 kernel. On an old system the debian default kernel should be good enough. 4. edit /etc/fstab and rename all linux partitions from /dev/sda to /dev/hda. Fix /boot/grub/menu.lst and put in a line for the initrd image for the debian kernel. 5. put HD back in k6 machine and boot.